What Bird is This #10? Our last Mystery Bird Challenge edged us into the realm of the LBJs (Little Brown Jobs), which is scary territory for most aspiring birders (and many competent ones as well). In this group, instead of the bright greens and scarlets of the turacos or the varying shades of blue of some the kingfishers, you simply have dull brown, at least for the most part. Identifications start to rely on more complicated things like supercilium length, heaviness of streaking, gape width, patterning of the retrices and other seemingly indistinguishable traits. That sounds pretty heavy, but it can be the level you need to get to if you really want to know what bird it is you are looking at. This week’s bird spares us a lot of that trouble as its call is very distinctive. Well, it helps those of us who can hear it, but you should have more than enough to go on in this photo towork it out, or at least make an accurate guess. This individual was in full voice when the photo was taken, and in fact these little guys simply won’t shut up at the moment (yes, that’s a hint!). Answers, as usual, to be released in Friday’s TWIP. on What Bird is This #10? Those LBJs are always fun to attempt to ID and its even better when you can hear them and get that definitive ID. I am calling this as a Monotonous Lark (Mirafra passerina). The white throat patch while the bird is calling is diagnostic. Monotonous Lark. Should I say it again? 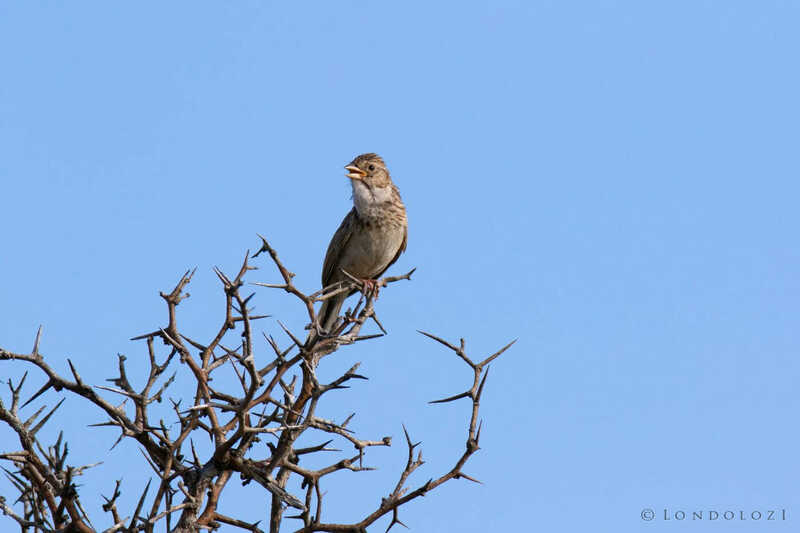 Monotonous lark…we heard it ALL the time we were there! LOL The name is a Good one! !